Rawlins Paints offer a wide range of 2-pack (a resin base component supplied with a separate chemical activator to be mixed together before use), ‘heavy duty commercial sector’ and industry leading floor paints. These are ideal for areas of heavy vehicular use in industrial spaces, where only the most durable and hard-wearing surface coatings will do. 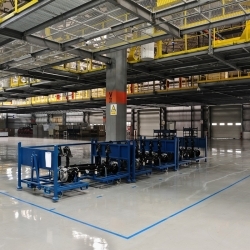 The heavy-duty concrete floor paints in this section are able to offer chemical resistance, UV stability, fast curing times and added flexibility. 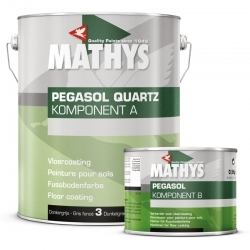 They consist of epoxy floor paint, polyurethane floor paint, solvent free, MMA, polyaspartic floor coatings and more which are products that can withstand the harshest conditions. 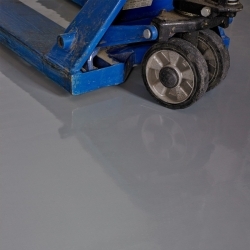 For industrial environments and on concrete floors where extremely heavy equipment and machinery needs to be permanently set-up, a reliable, self-levelling floor paint system is a must – one that offers years of resistance to extreme wear and tear, potential impact from dropped tools and even Winter Grade paints for the harshest of cold storage conditions. For any further technical or application advice on the products listed here, please contact us on 0113 245 5450. 304 HD Epoxy Floor Coating is a two-pack solvent-free high-build epoxy resin system for application as a heavy duty floor coating for concrete, steel and other substrates. It will provide a chemical and abrasion resistant smooth gloss finish. A self-levelling epoxy screed laid at 2-3mm by serated trowel/rake and spiked roller leaves an attractive finish with excellent resistance to many chemicals. 307 Flexible Deck Coat is a solvent free, flexible resin coating modified to impart toughness, resilience and waterproofing properties. The abrasion and impact resistance, together with the low temperature flexibility and excellent adhesion to concrete, make 307 Flexible Deck Coat ideal for surfaces subjected to frequent vehicular traffic. Blackfriar Professional Epoxy Floor Paint comes from this full range of hard-wearing, heavy duty, easy-to-clean floor coatings, ideal for indoor and outdoor heavy traffic areas. It offer excellent resistance to chemicals and abrasion, while its low-odour formula makes it ideal for sensitive areas. Blackfriar Professional High Traffic Floor Paint is an exceptionally hard-wearing, high performance, easy-to-clean 2-pack solvent based floor coating ideal for indoor and outdoor use. Provides outstanding resistance to a wide range of chemicals, non-yellowing, excellent colour fastness. 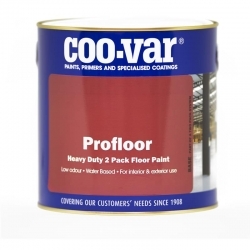 Coo-Var Profloor 2 Pack Epoxy Floor Paint is an exceptionally hard wearing water-based, solvent free two pack epoxy floor paint coating, suitable for heavy duty traffic and wear. It can be used for projects both inside or outside and is ideal for use in heavy traffic areas with fork trucks and vans. The concrete floor paints in this section are ideal for: Warehouses, store-rooms, boiler rooms and facilities, factory units – food and beverages, heavy-load machinery, manufacturing plants – showrooms, school corridors, cold storage rooms, garages, workshops and more. 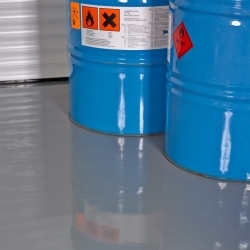 Epoxy floor paints are most commonly used in heavy-duty and industrial facilities, where a tougher coating, with improved abrasion resistance is a necessity. 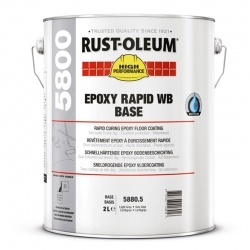 These paints are supplied in two liquid components (an epoxy resin and a hardener). They must be mixed together directly before application as a floor coating (full proportional measurements are provided with each product) and most can be applied simply by brush or roller. The coating will dry to leave a smooth finish, but paint additives can be added to create a gritted and anti-skid surface – as often found in frequently wet areas in food processing plants that generate a lot of steam – such as oven chips, soups and tinned cooked meat. Full technical and application support is available from Rawlins Paints. Epoxy floor paints provide an economical solution to a hard-wearing floor coating that are simple to apply and give a wide choice in colour that can be easily applied. These are areas where medium to heavy vehicular use is a daily thing and the floor surfacing must be able to withstand oil, petrol and other chemical spills, without eroding through or corroding the floor paint. The surface may preferably need to be self-levelling, for health and safety reasons, or for easier transportation of sensitive equipment around the work-space. As garage and workshops frequently have access doors open during working hours, the floor coating will need to be able to withstand excessive sun and UV exposure. For the other seasons, it’ll also need to stand up to rain, sleet and snow falling/dripping off cars, vans, pallet-trucks and lorries that are brought in for repair. It’s not always possible to clean up mild chemical spills under vehicles, or rain/snow, so the heavy-duty floor coating will need to be resistant to these chemicals – especially salt from rain water – which can cause a lot of damage to concrete and brick. 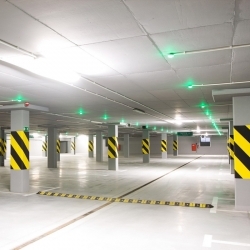 Many garages and workshops have floor marking for parking bays and equipment zones. Rawlins Paints also sell a wide range of line marking paints and tapes, ideal for this. Warehouses, such as those found in major supermarkets and retail outlets, often have stock that stands still for large seasonal periods of time. Storage trolleys and cages may require a non-slip, finish for staff to safely manoeuvre them from the shop-floor back into storage. They will also need to regularly undergo strict health and safety checks for damage and hygiene properties. It is not enough to wear suitable shoes and the floor surface must be able to withstand damage from dropped stock, forklift truck access and heavily stacked items – such as heavy-duty metal garden equipment. All warehouses will have delivery bays, where the interior flooring will be exposed to harsh weathers, as well as delivery truck access. 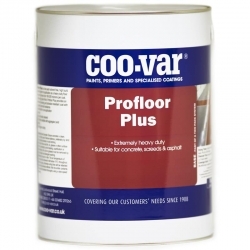 For these purposes, specific heavy-duty floor paints by Coo-Var, Jotun, Mathys, Sika and Rust-Oleum will be suitable. Whilst it is procedure to use appropriate transportation equipment to move around gas bottles or liquid filled drums, they will frequently need to be jimmied into place, and this can cause friction damage. The heavy-duty floor paints available at Rawlins Paints can withstand many types of ‘pressure abuse’ from large and heavy objects. Whilst the definition of a factory is standard, the types of goods processed, built or developed in one will cover an incredible range. From major car brand manufacturing plants, to factories processing or packaging foods, each will have bespoke and top-of-the range technical equipment. The contact point of an object with the floor must be of optimal quality – not only for insurance or health and safety reasons, but for longevity too. These types of plants have high pedestrian traffic, often accessed 24/7 by staff, and will therefore need to be cleaned a lot. Many of these environments will use industrial cleaning equipment, so the floor coating must be chemical resistant. Rawlins Paints also stock damp-proof coatings which are ideal for situations where the substrate may have residual moisture from either being freshly laid or through lack of a DPM (Damp Proof Membrane). Perfect for new build or old building renovation. Typically used by professional, experienced applicators due to their extremely short working time. MMA coatings are ideal for many aspects of exterior and car park coating and marking, as well as being used on specific internal projects MMA paints can be applied over worn-out and degraded thermoplastic road markings (ensure the surface is sound before application). Often the preferred system for heavy-use motorway junction road markings – see also pedestrian crossings, yellow boxes and stop/yield areas. 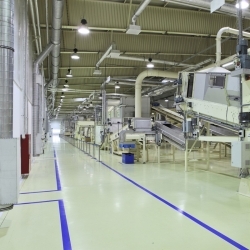 Polyurethane paints are usually chosen for their high gloss finish, excellent UV, weather and chemical resistance, as well as being ideal for industrial sectors where a hygienic floor coating is required – high moisture/high humidity environments. Sika offer a particularly good polyurethane range of coatings with some of the industry’s best self-levelling systems. As with all paints in our online store, we recommend reading the data-sheets provided, as each paint will offer different qualities to a job. There is no one paint that does all jobs, and for some projects polyurethane coatings will be ideal – with several different brands providing polyurethane paints at rawlinspaints.com, please contact us for further support, if required.